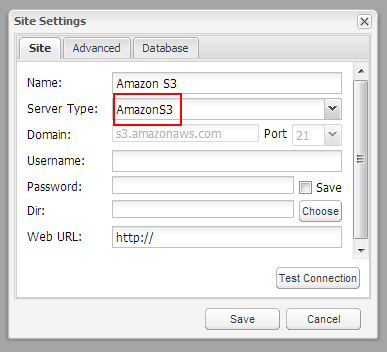 Have the convenience of managing your Amazon S3 account from within ShiftEdit. It can be added like a normal site and will work in the same way. You can connect with your access credentials. Use your Access Key for the username and your secret key as your password. By default the files you upload will be world-readable. You can change this behaviour in the advanced tab by un-ticking "S3 upload with public access". Deleting buckets is currently disabled.